Screens are ubiquitous in modern life. They not only entertain and inform, but have fundamentally changed the way we read, socialize and engage with our world. A thoughtful dialogue about the role of screens in our society, undertaken with an interdisciplinary and multi-generational approach, highlighted the October 28 panel presentation, “The Liberal Arts and the Digital World,” held in Lecture Center 102. The inaugural event in the College of Liberal Arts and Sciences’ year-long series, “Without Limits: Interdisciplinary Conversations in the Liberal Arts,” the presentation united three faculty members and a student to share perspectives informed by their research in the humanities and social sciences. In introducing the panel, Cyrus Mulready, an associate professor of English, said he and series co-chair, Associate Professor of Anthropology Ken Nystrom, wanted the first event to be a “conversation.” “We presented them with the topic and ideas of our series…and asked them individually to respond, to bring their knowledge of their disciplines, their learning, to the questions of our series and speak to them from their points of view,” he said. 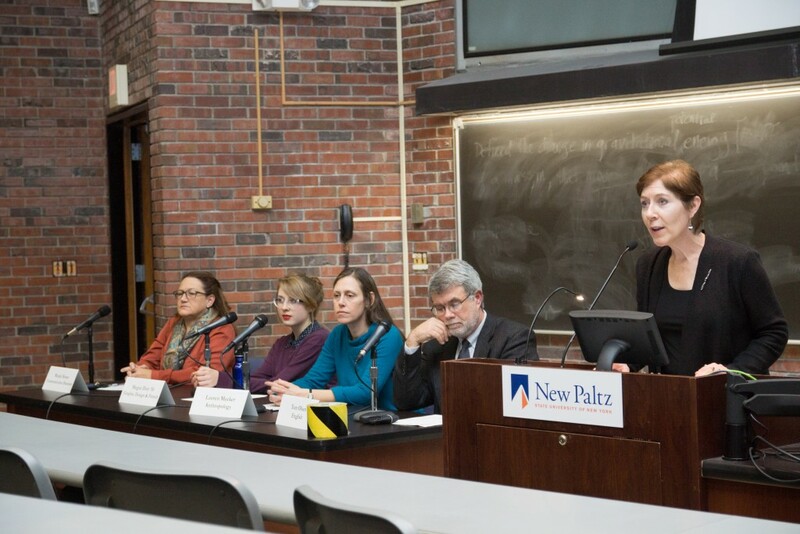 Dean Laura Barrett championed the value of the liberal arts in her opening remarks at the October 28 panel presentation, “The Liberal Arts and the Digital World.” Joining her are panelists (l-r) Wendy Bower, Megan Doty, Lauren Meeker and Thomas Olsen. Drawing from material from his course “From Gutenberg to Google Books,” Olsen described the affordances of printed books, the qualities unique to the medium which allow readers to recall the location of memorable passages, understand their reading progress by the weight of the pages in their hands and annotate pages with ease. “Embodied reading,” said Olsen, distinguishes reading a book from reading in a digital environment, and facilitates the deep, sustained reading of often difficult texts. “It is a general theory that we read not just with our brains and our eyes, we read with our bodies. Our hands matter, the weight of the book matters,” he said. Olsen noted a recent trend in designing e-readers such as the Kindle with a simple interface that more closely resembles a book, and removing previous music players and other applications. Even as educators worry that all reading is becoming conditioned by distraction, Olsen sees a “reclaiming of traditional forms of reading” in the design and promotion of digital devices. Olsen encouraged the audience to be mindful of both the benefits and risks of screen reading. “We’re in a very exciting time when we have both the burden and opportunity of choice. Most of our reading can be done in one or more media, and we should be thoughtful about that,” he said. Megan Doty ’16 (Graphic Design and French) explored the possibilities of digital scholarship and the role of graphic design in creating more comfortable, accessible reading environments. Good design considers readability across platforms, typography and line lengths, as well as accessibility, Doty noted. Adding a tag within the html structure of a web page allows screen readers to tell those with visual impairments what an image is even if they can’t see it, and translation features make content accessible to readers who speak different languages. New technology also allows innovations like “digitally native articles” that present information in a non-linear fashion, often enhanced by photographs, interactive maps and other multi-media features. Doty drew from her Summer Undergraduate Research Experience (SURE) project with mentor Amy Papaelias, an assistant professor in the Art Department. Doty helped produce a special issue of the Visual Language Journal, the first available both in print and on the web. Doty created illustrations for the project to draw readers in and considered readability on a typographical level. Noting that “the merits of publishing on the web have not been embraced by scholars,” Doty championed the unique benefits digital scholarship offers both scholars and readers—the ability to create global communities of interest, the accessibility afforded to those without access to university libraries and the rapid spread of ideas and information. Wendy Bower, an instructor of communication disorders, considered the effects of screen usage on the language development of young children and the potential of digital environments to improve the social relationships of children and teens with autism spectrum disorders. Citing research from the Kaiser Family Foundation that 74 percent of infants and toddlers watch television before the age of two, Bower noted that passive television viewing has very little educational value and cannot replicate the interactive communication in a real-world context required for language acquisition. In her research on adolescents with social pragmatic disorder, Bower found that screen time can be surprisingly beneficial. Bower studied seven teenage participants in her department’s multi-week social skills group and analyzed their text messages over a one-month period. Social pragmatic disorder, Bower noted, was previously defined as an autism spectrum disorder (ASD). Individuals with ASD are particularly drawn to television, movies, video games and other technologies with interactive capabilities, and educators often use electronic learning tools to keep ASD students engaged and productive. Lauren Meeker, an associate professor of anthropology, explored the ethics of ethnographic filmmaking in the age of the viral video, when productions often “take on a social life of their own” after their release. Meeker argued that at least three ethical systems are always at work in ethnographic films: the filmmaker’s ethics, the subject’s ethics and the ethics of the film’s viewers. An ethical approach to filmmaking, Meeker argued, begins when a filmmaker considers the implications of these often-competing ethical systems prior to shooting. When a filmmaker “implicates herself in the filmmaking process” and creates a film with a more reflexive structure, she reveals the extent to which a film is just one perspective, and not objective truth. Ethnographic films, which are based on anthropological research and informed by theories of culture, may also reinforce stereotypes when subjects are portrayed in an incomplete or one-dimensional way. Meeker said filmmakers have a responsibility to ask questions about how their films may be received and what harmful effects they may have on both the film’s subjects and viewers. Meeker shared her work as an ethnographic filmmaker shooting in Vietnam, and noted that she seeks input from her films’ subjects in all phases of filmmaking—in development, editing and creating a final cut that responds to their crucial feedback. Meeker said asking difficult questions about ethics must remain at the forefront of her work and the work of other scholars. “The most important thing when thinking about ethics is to keep these kinds of questions open and in circulation, to engage with them both in our own disciplines and also across disciplines, because they have implications beyond the boundaries of anthropology,” Meeker concluded. Laura Barrett, dean of the College of Liberal Arts and Sciences, said the presentations “spoke to each other in interesting ways” and accomplished a series goal. “’Without Limits’ aims to bridge our vast array of disciplines so that faculty, students, staff and community members are encouraged to see the multiple lenses that offer essential perspectives and to recognize the importance of the humanities and social sciences in the development of thoughtful, engaged and productive citizens,” Barrett said. Spring programming will begin the week of April 25, when Jessica Pabon, an assistant professor of Women’s, Gender and Sexuality Studies, and Cesar Barros, an assistant professor of Languages, Literatures and Cultures, will join internationally renowned street artist Pau in a discussion of the digital distribution of street art. Pau will demonstrate her work on campus by painting a mural over the course of several days. “Without Limits” will conclude with an April 28 lecture by Brittney Cooper, an assistant professor of Women’s and Gender Studies and Africana Studies at Rutgers University. Cooper’s research interests include hip hop culture and visual representations of race. For more about the “Without Limits” series, and to view a video of “The Liberal Arts and the Digital World,” visit the program website at http://www.newpaltz.edu/collegelas/without-limits/.